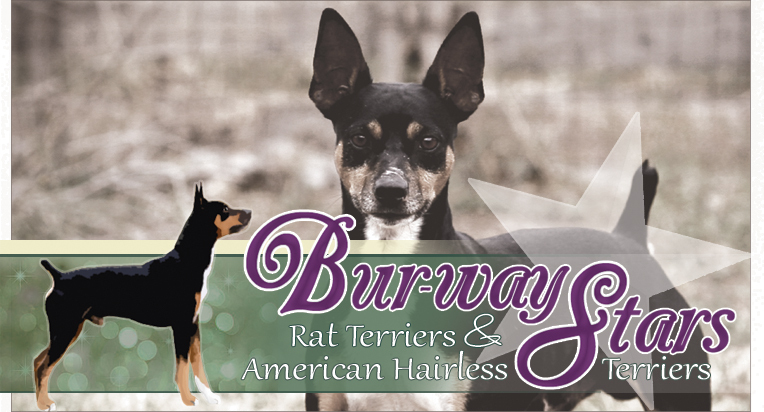 We raise, show and perform with our Rat Terriers. Both myself and our daughter work together to keep things running smoothly. We are right in the middle of North Central Texas...almost to the Oklahoma border. We live on a beautiful, 60 acre ranch, where our Rats are allowed to hunt and play...the entire day through. We feed a RAW diet with some grainfree kibble occasionally used...our dogs get plenty of exercise. Pups are born in the house...with lots and lots of socialization. We do OFA/Penn-Hip testing for LCP, CHD, Cardiac and patellas, all our breeding dogs have been DNA tested for PLL(Primary Lens Luxation). We are very proud to say we have Rat Terriers here that have 4 generations of fully tested dogs behind them. All our dogs are dual registered with UKC and AKC. Dogs we have bred are titled in agility, obedience, Rally Obedience, weight pull, Terrier Racing, Barn Hunt and Nosework. Our Bur-Way boys and girls truly are all around workers! We love to hear their stories!